The workshop aims at inspiring the participants to look beyond what and how brands deliver, and go on a quest for the ‘why’. 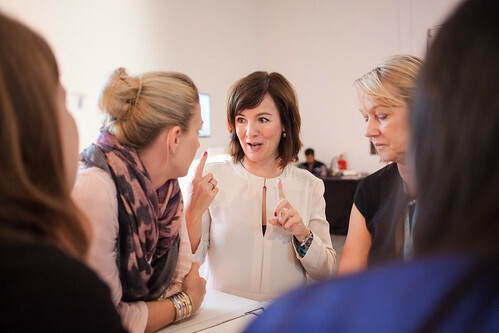 Through the workshop format, the participants get to test four different techniques that can be used when seeking a brand’s purpose. As an example we work with the brand DLDwomen. At the end we will have an idea of what the participants think about the brand, which can give valuable insights in what makes DLDwomen unique. Set-up: Join us for a 10 minutes introduction by Birgit Berthold-Kremser and Catarina Tagmark about the importance of a brand and how to find the brand purpose. Afterwards, we will use World Café to work in groups on 4 themes at 8 tables, letting participants change the table every 10 minutes to take part in the discussion at the new table. At the end, each participant will have spent 10 minutes on each theme. This workshop was part of the DLDw14 learning conference. It took place on Tuesday, July 22, at 9am. Do not hesitate to contact me if you had any questions here.